Adele has been in the beauty industry for 28 years. In her vast experience she is able to individually modify her treatments to suit her clients needs. Adele continues to update her professional development each year so she can keep abreast of new treatments available. 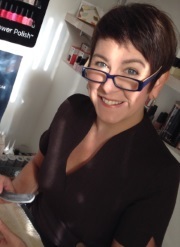 Adele specialises in Semi permanent make up/ Microblading, electrolysis, removal of skin tags, milia ,red spots, veins, cholesterol spots and many other skin adhesions. Adele also works closely with re –enhance skin and body clinic on Cecil Rd in Hale where we use several lasers to remove/reduce tattoos, veins, hair, along with many more advanced treatments to rejuvenate the skin and to reduce cellulite.